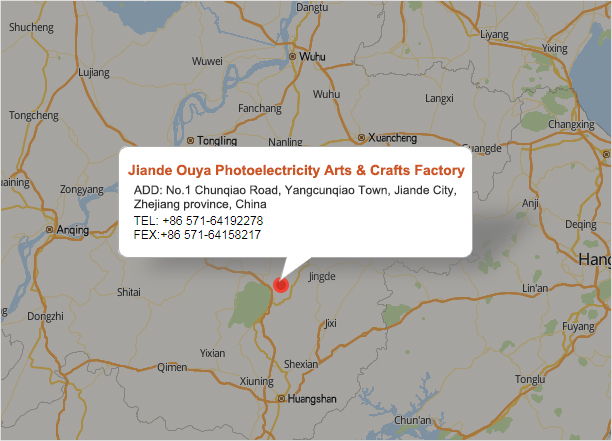 Jiande Ouya Photoelectricity Arts & Crafts Factory, established in 2003, is a professional manufacturer of varieties of novel lamps. plasma ball lamps, mini disco lamps, neon lamps, lumin disk, lava & glitter lamps etc. it covers about 3,000 square meters,located in Jiande City, Zhejiang Province, China, With advanced technology and complete equipment. We've not only successfully developed the high-end market, but also built up our own quality products for all our clients and gained a very reputed response from the markets at home and abroad. In view of the extensive developing, we successfully applied for GSV and BSCI factory audit in 2017. and we will insist on our perpetual policy " Excellent quality, reasonable price and timely shipment," serving all customers. We warmly welcome all inquiries or business contacts for our products.